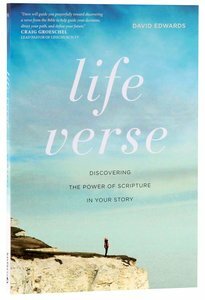 :The Life Verse experience helps readers see the broad themes of Scripture and overlay them on the themes of their own lives. From there, author David Edwards invites readers deeper into Scripture to find their personal life verse and to understand the richness of its context and the fullness of its application. Finally, readers learn how to use their life verse in sharing Christ with others. This compelling experience helps readers learn to see the Bible thematically, read it personally, and share Christ in a natural and biblical manner, while finding their true identity in God's Word. This book will help you Discern where you're at, Discover that life verse, Develop the life verse, go Deeper with the verse. Customer Reviews For "Life Verse"
Empowering and a merciful blessing! Reading through this book, which I couldn't put down, has totally changed my outlook into an even more hopeful future. With God's help, you can face your past, evaluate it, look at the present, and see into the future through the lens of a life verse that - with prayer, supplication and an openness to His guidance - God will impress on your heart. With your verse in mind, it helps you see everything in a brand new, Christ-filled and empowered light. This book is a good read for anyone, at whatever stage you are at, if you desire to begin a new chapter in your life. A merciful blessing!